Buy Industrial microwave peanut roasting machine with CE certificate - Shandong Microwave Machinery Co.,Ltd. 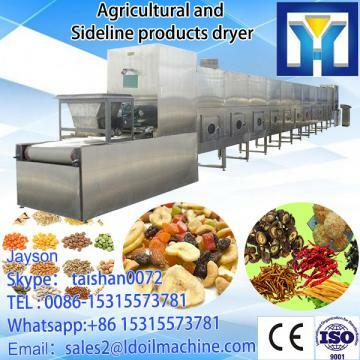 products, Marine products, feedstuff, tea, nuts and other granular, sheet, strip block and drying sterilization of Industrial microwave peanut roasting machine with CE certificate. 6. 1 year complete warranty for Industrial microwave peanut roasting machine with CE certificate. D, Due to simultaneity of each part of materialâs sterilization, sterilization time is short, can avoid the long time heating and effect food good quality, especially for food that are not suitable for sterilizing in high temperature or a long heating time. For example: volatile sweet essien components of ginger powder, contains more moisture of fresh and tender jellyfish, etc. For not only keeping for color, smell, taste and same quality requirements, etc,but also for material the need sterilize, using microwave sterilization can achieve the best effect. Shandong Microwave Machinery Co.,Ltd.is a Agricultural and Sideline products microwave dryer factory specializing in the production of Industrial microwave peanut roasting machine with CE certificate, scientific research,manufacturing,installation, commissioning.Shandong Microwave Machinery Co.,Ltd.can provide Agricultural and Sideline products microwave dryercustomers with design and services of 1-2000 tons Industrial microwave peanut roasting machine with CE certificate. Shandong Microwave Machinery Co.,Ltd. have finished hundreds of successful projects Agricultural and Sideline products microwave dryerover the years: peanut oil, soybean oil, rapeseed oil, cottonseed oil, sunflower oil, sesame oil, animal oil,grape seed oil, acer truncatum oil, peony seed oil, walnut oil, hemp seed oil, pine oil, tea seed oil, papaya oil, milk thistle seed, and other special type Agricultural and Sideline products microwave dryeroil. Shandong Microwave Machinery Co.,Ltd. have independent import and export department. Shandong Microwave Machinery Co.,Ltd. Agricultural and Sideline products microwave dryerequipment has been successfully exported to more than ten countries: Russia, Australia, India, Afghanistan, Cameroon,and so on.